The ashy minivet (Pericrocotus divaricatus) belongs to the family of cuckooshrikes and minivets, the Campephagidae. The ashy minivet species is distributed in India, southeast Asia, China, Japan, North Korea, South Korea, Russia and Taiwan. These minivets are mostly migratory birds. These minivets are monotypic species. The ashy minivet (Pericrocotus divaricatus) is a small bird, measuring 18 to 20 cm in length and weighing 20 to 30 grams. These species are sexually dimorphic. They have white and gray plumage. The male ashy minivet has narrow black forehead band, white forehead and forecrown. The rear crown and the nape are black. The black lore passes through the eye and extends to the nape. The ear coverts are black. 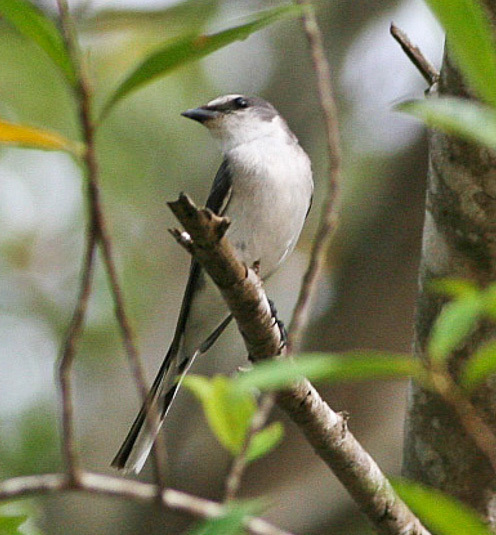 The upperparts are gray and the underparts are whitish. The outer tail is gray and the undertail is whitish. The outer tail feathers are white. The female has a gray cap and gray lore. There is a whitish supercilium. The bill is sharp and black in color. The irises are dark brown. The legs and feet are black. The call of these species is a metallic, jingling, trilling "hirihiri..hirihiri" sound. The breeding populations of the ashy minivet are distributed in the northeast China, southeast extreme of Russia, North Korea, South Korea and Japan. Breeding resident populations are found in Taiwan and the islands in East China Sea. The ashy minivet wintering populations are distributed in India, central and southern Myanmar, Thailand, Laos, Cambodia, Vietnam, peninsular Malaysia, Indonesia (Sumatra, north Sulawesi) and Philippines (north). In India, these species are distributed in the states of Maharashtra, Goa, Karnataka, Tamil Nadu, Andhra Pradesh, Telangana and Kerala. The Important Bird and Biodiversity Areas (IBA) of the ashy minivet species in Japan are, Okutadami, Okunikko, Okutone, Mounts Asama, Shirane and Tanigawa and Mounts Kurikoma and Yakiishi. 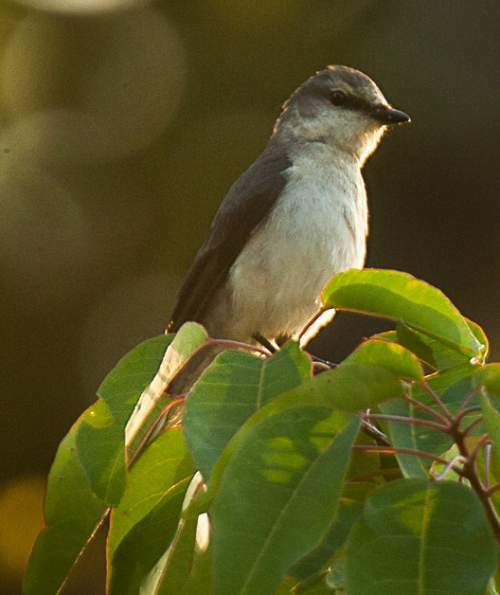 These ashy minivet species have moderate forest dependence. They normally occur in altitudes from 0 to 2000 meters. The artificial ecosystems and habitats of these ashy minivet species include cultivated lands, plantations, rural gardens, urban areas and heavily degraded tropical and subtropical forests. 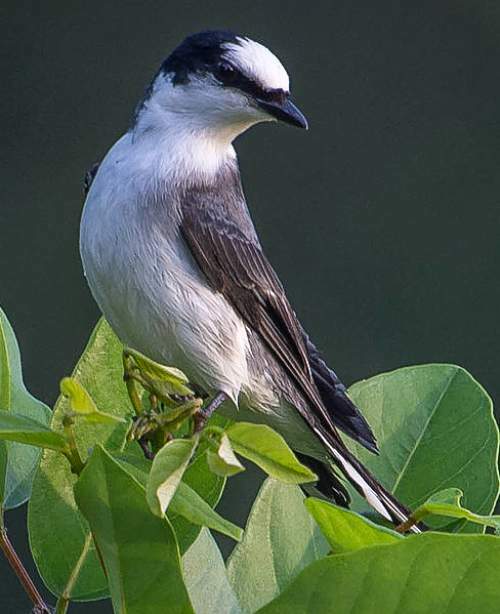 The natural ecosystems and habitats of these ashy minivet species include, evergreen forests, tropical and subtropical moist lowland forests, mangrove forests, temperate forests, deciduous forests, dry shrublands, areas with scattered trees and dry grasslands. The diet of this ashy minivet consists mainly of insects. Beetles, ants, butterflies, moths and insect larvae are their primary food. These minivets forage mostly at upper levels of the canopy. The breeding season of these ashy minivet species is during May to June in Russia. The laying season is from May to July in Japan. These birds are monogamous. The nest is built on tree branches and most of the nest building is done by the female. The ashy minivet nest is a small, deep, cup shaped structure, built with roots, twigs, rootlets and grass. The clutch contains four to six eggs. Both the parents incubate the eggs and raise the young. The chicks hatch out after 16-17 days. These ashy minivet species are mostly migrant birds. The breeding populations are distributed in eastern Russia, northeast China, Japan, North Korea and South Korea. These populations move southwards for wintering, passing along the eastern China. The wintering birds are distributed in India and southeast Asia. Small native resident populations are found in Taiwan and in several islands in East China Sea. The global population size of the ashy minivet (Pericrocotus divaricatus) has not been quantified. The overall population trend of the species is considered to be stable. In most of its range, this species is reported to be common to rare. The generation length is not known. Its distribution size is about 3,110,000 sq.km. The ashy minivet (Pericrocotus divaricatus) does not approach the thresholds for being Vulnerable either under the range size criterion, or under the population trend criterion or under the population size criterion. The CITES (Convention on International Trade in Endangered Species of Wild Fauna and Flora) status is ‘Not Evaluated’ for ashy minivet (Pericrocotus divaricatus). The ashy minivet (Pericrocotus divaricatus) is closely related to brown-rumped minivet (Pericrocotus cantonensis), the rosy minivet (Pericrocotus roseus) and Ryukyu minivet (Pericrocotus tegimae). It was earlier considered conspecific with P. tegimae. Current topic in Birds of India: Ashy minivet - Pericrocotus divaricatus.